It was our pleasure to host the 20th International Conference on Computing in High Energy and Nuclear Physics (CHEP) in Amsterdam, The Netherlands. For 5 days, from Monday October 14th and concluding Friday the 18th, we saw almost 500 contributions, listened to almost 200 talks and reviewed over 300 posters - right in the centre of Amsterdam in the Beurs van Berlage, a landmark building built on top of the river Amstel which gave Amsterdam its name. facilities, production infrastructures, networking and collaborative tools. 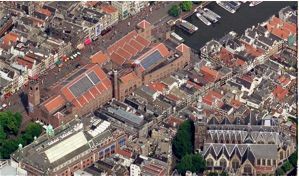 Nikhef, the Dutch National Institute for Sub-atomic Physics, is pleased to host this special 20th edition in Amsterdam. Home to 174 different nationalities, Amsterdam is a true melting pot of cultures. The city centre with its famous canals breathes history and gives the city its character; the warehouses once used for trade have now been converted into apartments that mingle comfortably with international financial institutions nestled in 18th-century mansions. Amsterdam is located near Amsterdam Airport Schiphol, one of the biggest and most modern airports in Europe. The city has a remarkably compact centre with many interesting locations within walking distance, quite unique for a city that has almost 750,000 inhabitants. In addition to its fascinating mixture of cultures, Amsterdam also offers a nice blend of business and pleasure.